For options that go beyond the attractions of " sun and sand " visit our bio-region on the northern coast of Ecuador for adventure, culture, ecological, or agriculture tourism. While we have some of Ecuador's best beaches, we also have dry tropical forest, rolling agricultural plains, wetlands, mangroves, and tropical jungle, with ancient origins. The Ruta del Spondylus attracts thousands of tourists, surfers, fishermen and sun worshipers. Strolling along long stretches of deserted beaches where you can view humpback whales passing, and dolphins playing off-shore. 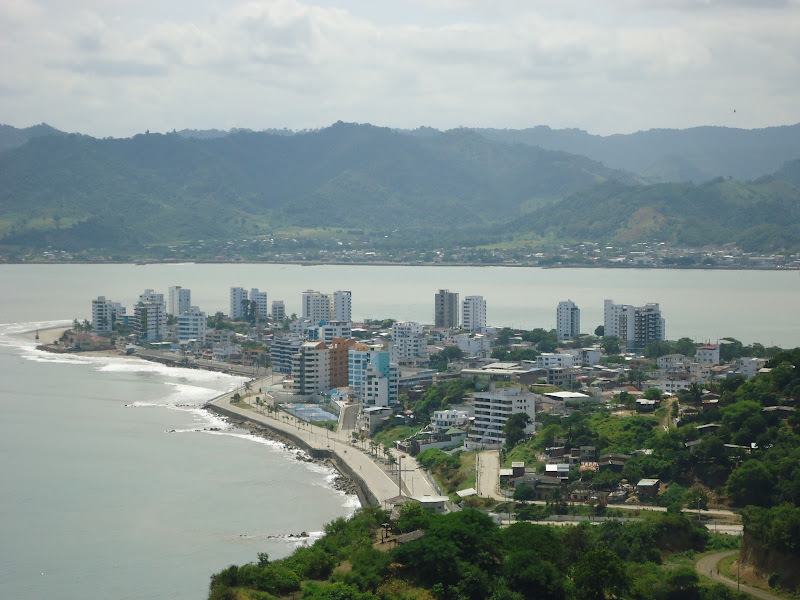 The bio-region includes the relaxed surfing town of Canoa, the eco-friendly resort city of Bahía de Caráquez, windsurfing hotspot of Crucita, the archeological site of San Isidro, and the agriculture centre of Chone. Due to both its location, and the province of Manabí's seafood, the province has an enviable reputation. 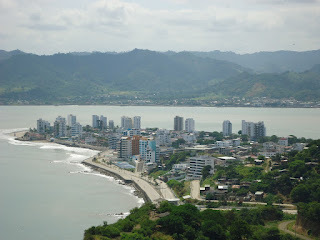 Bahía de Caraquez is one of the most beautiful cities on the Ecuadorian coast. Located on a narrow peninsula flanked by a chain of tall hills, the setting for Bahía is spectacular. The pounding waves of the mighty Pacific Ocean on one side, and the tranquil Chone River Estuary on the other side. Bahía lures those eager to be near the water. In 1998, the city was devastated by two natural disasters. Landslides caused by the intense El Niño storms of that year damaged many homes. Shortly thereafter, a major earthquake struck, damaging more of the city's homes and businesses. 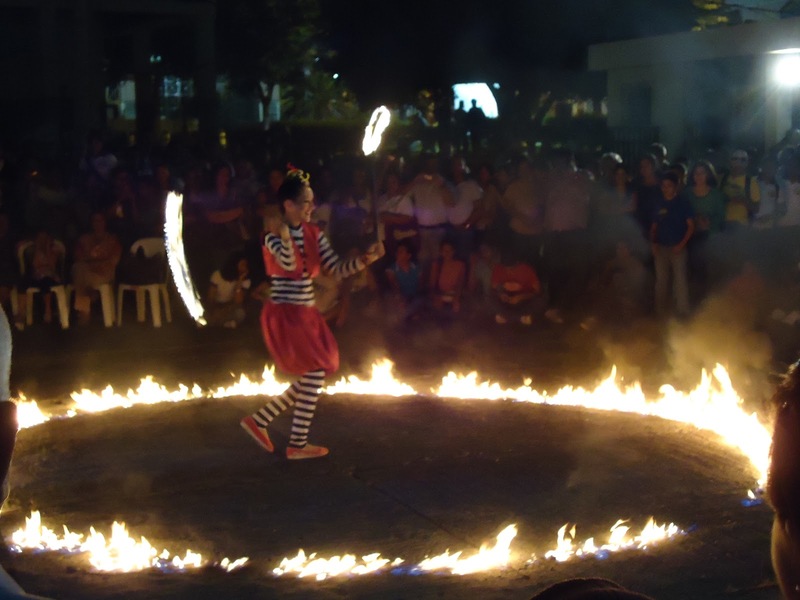 The community decided to reinvent itself, and in 1998 Bahía self- proclaimed itself one of the world's first eco-cities. Focusing on sustainable development and tourism, recycling and reforestation, the city has received attention from around the world. 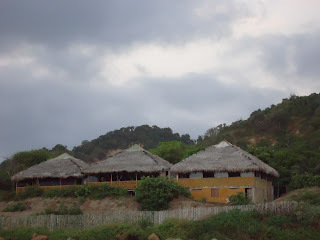 Starting at the base of the hills in the new tourist / artisan village along the Pacific Ocean wrapping 270 degrees around the city and then crossing the estuary by bridge to San Vicente the malecon forms the heart and soul of Bahia. The character of the malecon changes along with the surf, from restaurants, artisan stalls, to people filled beaches, shadows formed by tall apartment buildings, benches with local musicians, and the fresh breeze across the estuary. The seawall malecon provides some twenty three kilometres of uninterrupted pedestrian friendly pathways for walking, jogging, cycling, or rollerblading. The Mirador Cruz is Bahia's distinguishing landmark perched on the hilltop, and majestically lit at night. It is a giant cross with two staircases inside. 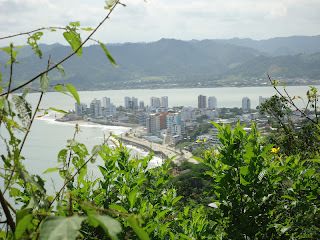 From it's base or viewing platform you have panoramic views overlooking the city, the estuary, and San Vicente. The Cruz is accessible from the city centre via several staircases which take about 20 minutes to ascend. Should it be a hot day, or if one is not up to the hike you can take a taxi up to the Mirador la Cruz and easily descend on foot. Fresh new facility, open daily in the morning, the central market provides fresh fruit, vegetables, eggs & dairy products, meat, poultry, fish, staples, flowers and much more for the daily lives of residents. 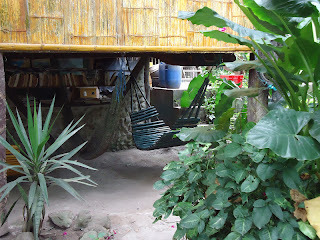 The environmentally friendly eco-taxis are a very common sight in the center of Bahía. While they form a daily vital part of the local citizen's transportation needs, they are also a great attraction for tourists. For fifty cents the eco taxi allows the tourist to see the town in an enjoyable and less disruptive manner. 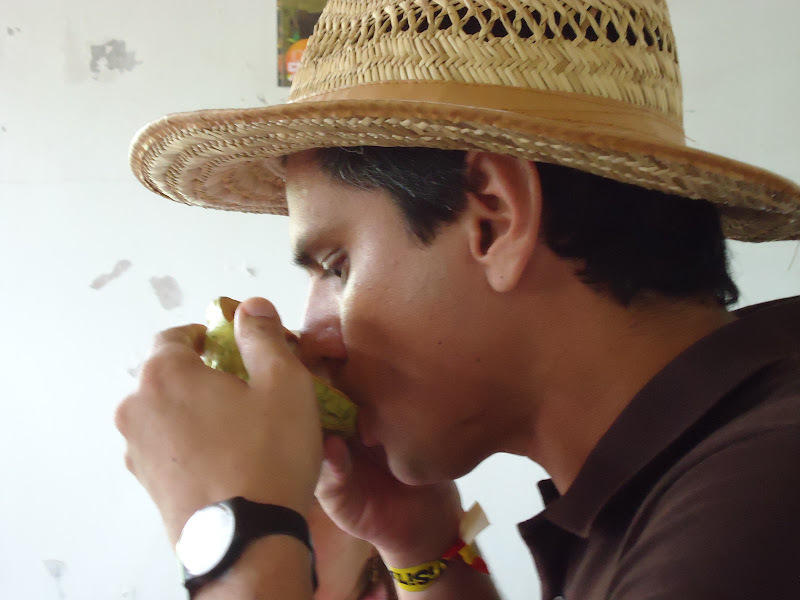 A highly recommended way to enjoy a sight seeing tour of Bahia. Currently Miguelito lives in a local elementary school where he is cared for as the school mascot. Miguelito is a Galapagos tortoise just over 120 years of age. The tortoise is a great mascot for the school and the city. The word Saiananda means the bliss of Mother Nature. In a serene setting you will find an unusual combination of native and domestic animals, ponds, exoctic plants and cactus and bonsai gardens. 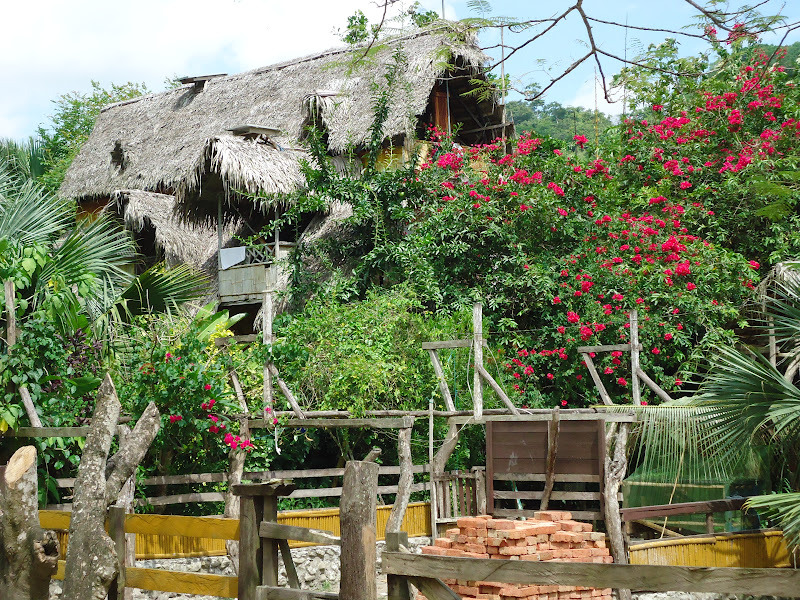 This location provides guest accommodation and a vegetarian restaurant in this nature reserve. The zoo at Saiananda displays a wide variety of animal species from many different countries, making it a unique and interesting attraction. There are a variety of beautiful beaches nearby. These beaches offer a relaxing setting for tourists and locals to enjoy. Playa El Faro de la Piedra, Punta Bellaca, Punta Gorda, Pajonal, San Vicente & Bricena are our local favourites. Whether you want to relax and worship the sun or take a more active role with Water Sports - Surfing, swimming, para sailing, jet skis, wind surfing, sailing, rowing and kayaking are some of the water sports that can be enjoyed within the tranquility of the estuary or challenge the Pacific Ocean. El Faro , the landmark lighthouse on the point, built in 1929, to guide ships. The bridge joining Bahía and San Vicente is the longest bridge in the country. It is fairly new having only opened on October 31st of 2011. The bridge measures 1980 meters in length and is beautifully lit at night. As the longest bridge in Ecuador, it is also a tourism site. For 60 centavos you can cross the estuary by water taxi. It is a refreshing ride and a wonderful way to see Bahia & San Vicente views from the water. The colourful beach city of San Vicente has a long stretch of sandy shoreline just across the estuary from Bahia. The city itself is full of colourful local charm, with plenty of good seafood restaurants, markets, and a community atmosphere. 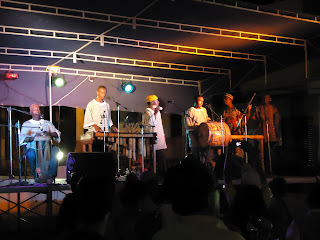 The culture is marked by a strong Afro-Ecuadorian presence. This mixed heritage of Indigenous and Spanish cultures gives a distinct flair in the gastronomy, music, and dance of San Vicente. San Vicente offers plenty of opportunities for ocean activities, sailing, surfing, kite surfing, and sport fishing. The main Church of Santa Rosa is a popular visit, with ornate murals and windows of mosaic stained glass. The daily market is also a sight to behold, located up the road on the way to San Isidro. A walk up San Vicente's hill is also recommended, as it affords great view of the city and the neighboring town of Bahia de Caraquez. people or those young at heart Canoa has a fairly active nightlife. The huts along the beach serve drinks well into the night, and there are several clubs on the main street. 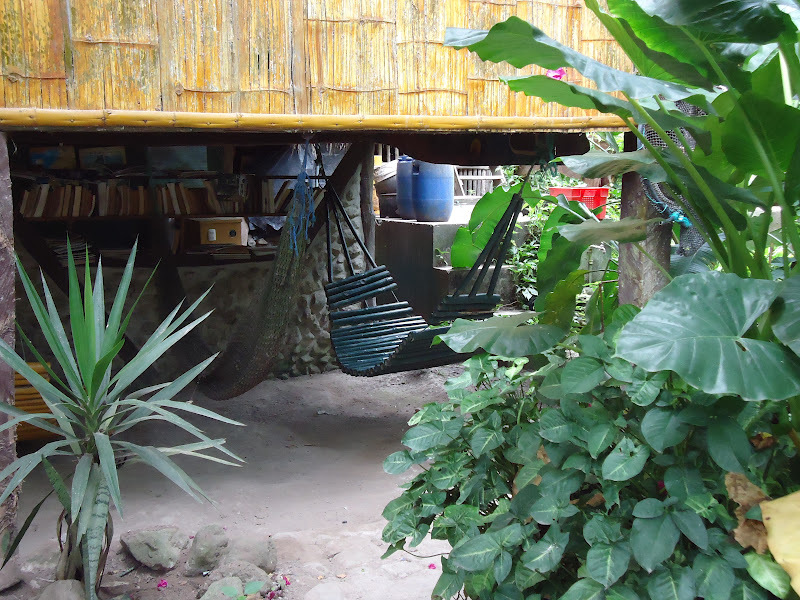 Canoa has activities for the adventurous and the easygoing. Learn to surf, go horseback riding, take to the skies in a hang glider, and visit a bat-filled cave ( according to legend there is a large emerald in the cave that belonged to the queen of the Cara tribe ); or relax on the beach or in a hammock. To see the coast from an extraordinary perspective from above try handgliding, or tandem paragliding. 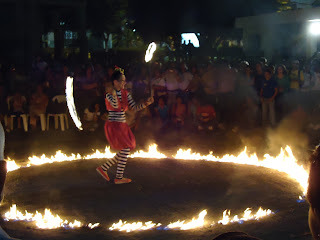 Crucita is world famous for wind sport activities. Many countries with coastal borders host surfing as an adventure tourist activity. Our warm waters, good beaches provide ample waves for beginner and experienced surfers. Hiking trails in Cerra Seco and Punta Bellaca are popular hikes for novices, enabling the experience of Ecuador's biodiversity. Experience the magical location of crystal clear waterfalls just 10 minutes outside of San Isidro (one hour north of Bahia) You can relax and enjoy a swim in the pools, canyoning (descend with the waterfalls) or bath beneath the falling water. The winds and Pacific coastline provide for excellent sailing and the calm waters of the estuary provide safe harbor for boats. This coastal region is full of great opportunities for kayak and canoe activities. The tranquil estuary provides the basis for exploration of the bird and water life by both kayak and canoe. Alternatively, the mighty Pacific ocean provides an exciting opportunity for sea kayaking and discovering the jagged coastline. Canoeing tours are offered through the mangroves around Isla Corazon and kayaking tours are offered out of Canoa to ocean caves. Due to the currents from the north and south coastlines, Ecuador is privy to warm winds, which form a good base for many wind activities. 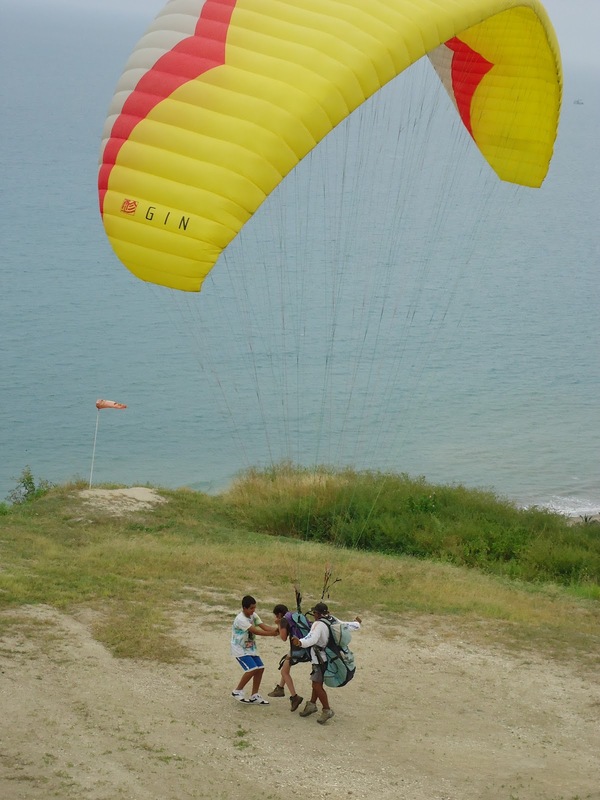 While paragliding is readily available, sports such as windsurfing and kiteboarding can also be enjoyed. These activities are all readily available for your participation and enjoyment. Isla Corazón is a fascinating experience for the variety, over 60 species, and quantity of birds. The heart-shaped island covers sixty hectares and is located a few kilometers upstream in the Río Chone from Bahía. Isla Corazón is a vibrant eco-tourism project where local fishermen have replanted and nurtured the mangroves and expanded the island. The ecological reserve is now under government environmental protection. 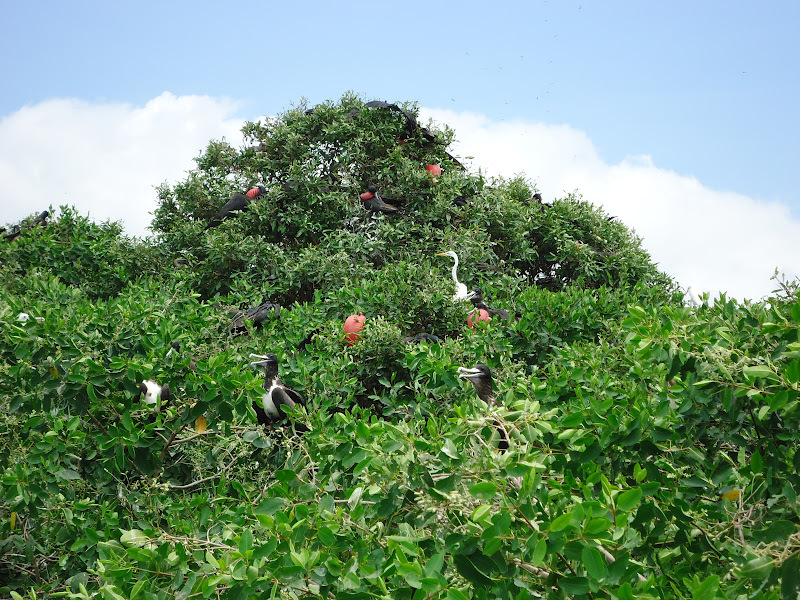 The mangroves of the island are a prime breeding ground for many species of birds, and here you will find one of the largest colonies of frigate birds. 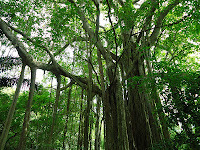 The local fishermen lead guided canoe tours through waterway mangrove tunnels of the island, and along an interpretive boardwalk and observation tower in the middle of the island. 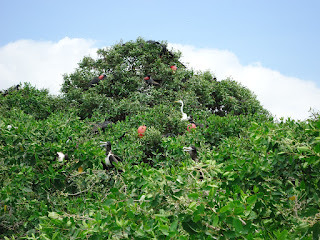 You will see dozens of different birds nesting, fish jumping, several types of mangroves, brilliant red crabs. 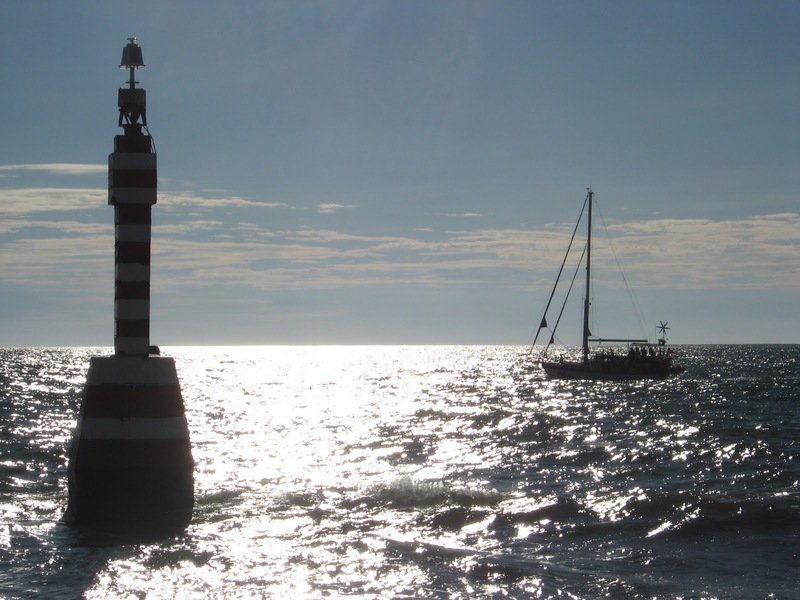 Tours depart from Puerto Portovelo, east on the estuary from San Vicente, where an excellent interpretive centre and educational video will start your learning experience. The tours are best enjoyed at low tides, and you can enjoy local fare prepared by locals while you wait. 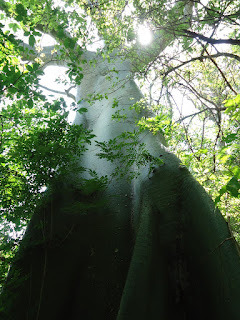 For some exercise walking & hiking in Bahia visit Cerra Seco Parque Nacional. This forty hectare protected area is one of the last tropical dry forests in the world. Located at the foot of the ocean in the south west portion of the city, it is home to a wide range of indigenous flora and fauna. The reserve's facilities include; a center for interpretation, ecological trails, and viewpoints. An interpretive guide is recommended to enhance your enjoyment and knowledge of the area. make chocolate, or make crafts from tagua nuts. The farm also offers guided hikes, giant tree, horseback riding, howler monkey viewing, a waterfall swim, indulging in clay face masks, and bird watching trips. 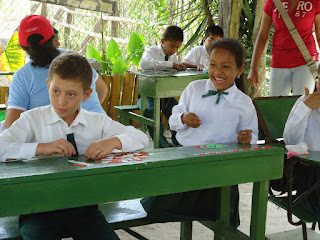 A small primary school educates children about waste management and reforestation. 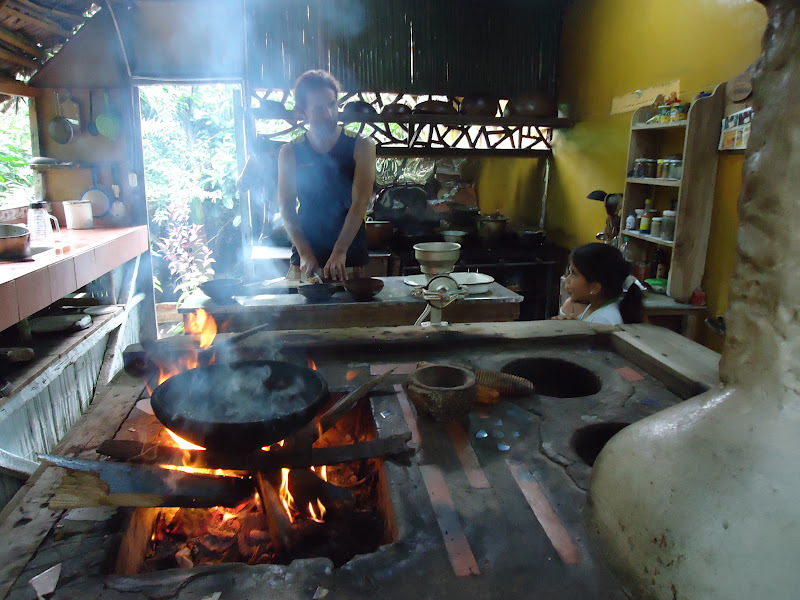 Courses in agroecology, permaculture, ecotourism, and Spanish are available or you can volunteer for longer periods. It has been recognized as one of National Geographic's favorite specialty accomodations in South America. Near San Antonio is "La Segua" a 172 hectares wetland area of worldwide fame to ornithologists and naturalists. This fabulous bird sanctuary is one of the most important wetland areas that can be found through the Ecuadorian Coast. The Segua is home to 164 various species of birds, 100 of which are migratory. This site has been named a Ramsar Wetland. 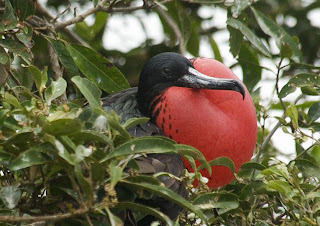 The variety in bird species creates the perfect attraction for bird lovers to view many species at once. Chame, an extraordinary fish capable of living 48 hours out of water, and cayman also reside in the wetlands. You decide wether you wish to relax in the observation tower or enjoy canoeing through the lagoons to more closely experience nature's activity. One of the country's largest dams is located about 16 km from Calcetta. It is 50 metres in height and some 700 meters in length across the Carrizal River. The river is the main source of water for the region and attracts tourists for water activities. Accessible by boat in the estuary, this island is home to mangroves, many bird species, and best of all it is a thermal mud site. This unique eco-tourism activity is currently offered through Saiananda. The Island provides the guest with a spiritual connection with nature by allowing them to bathe in the mud, and come into close contact with the biodiversity of the island. 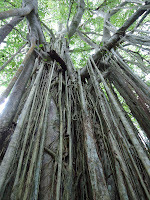 The island is free of any human development and provides a pure nature experience. 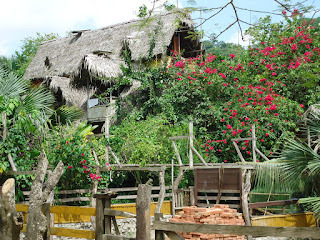 A worthwhile destination an hour north of Canoa. Where the cold Humboldt currents meet the warm currents of del Nino creates a geographical transition environment. The only area in South America where you can observe the flora and fauna of both tropical and dry forest co-existing in harmony. 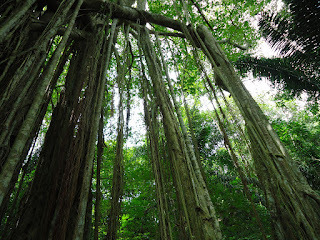 From dry cactus to tropical rainforest housing howler monkeys. We would recommend this area be toured by horseback, or more adventurous hiking. 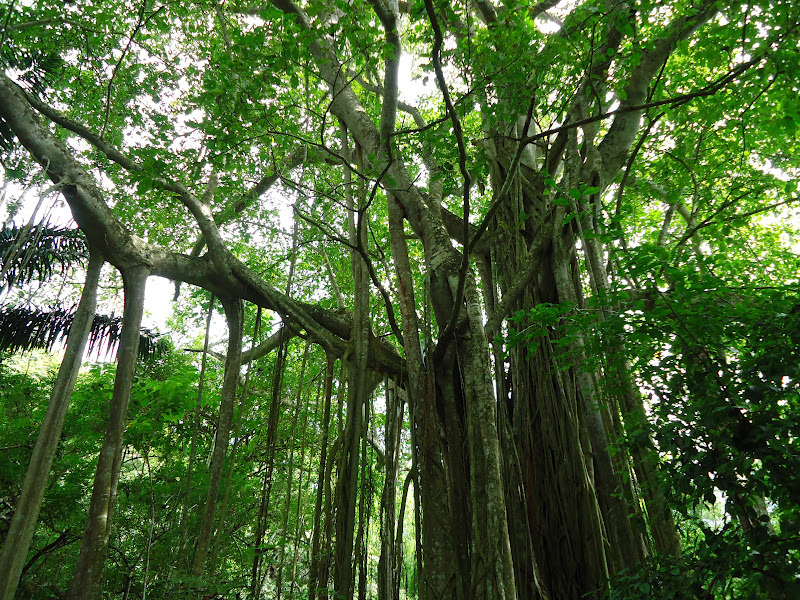 The reserve is operated by an organization dedicated to forest conservation and permaculture. 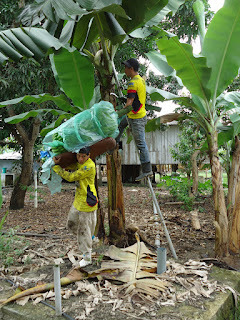 It is possible to visit the reserve to observe the organization's efforts. 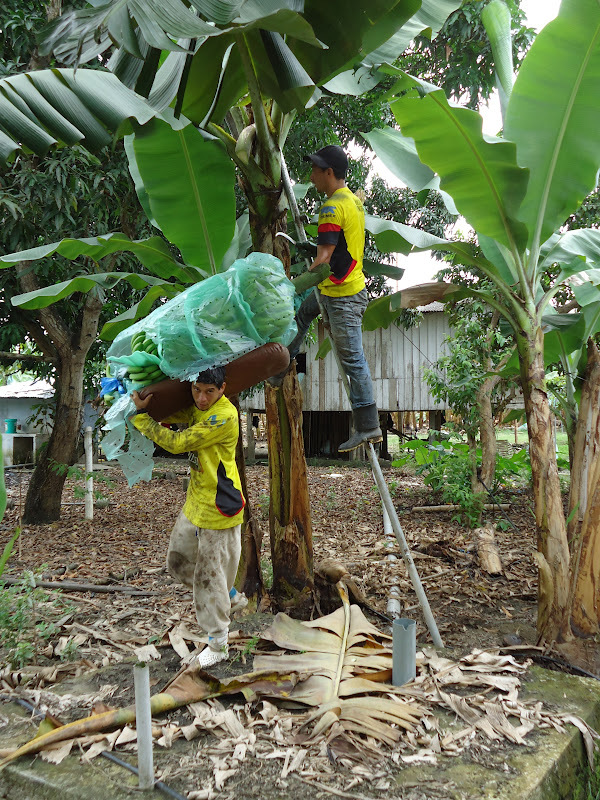 It is also possible to volunteer with reforestation work and live on the reserve with a group of international volunteers. 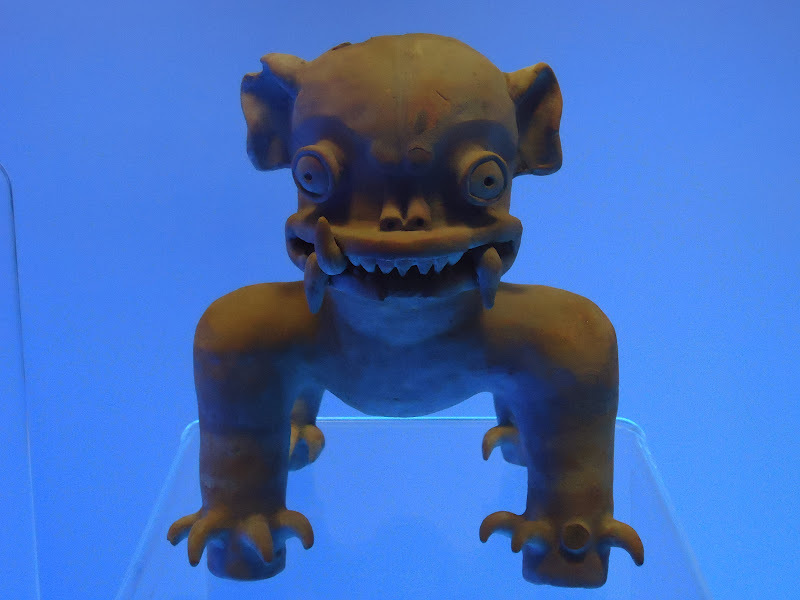 Free admission to the public, and for a welcome break from the sun, visit Ecuador’s third largest archeological air-conditioned museum in Bahía de Caraquez. 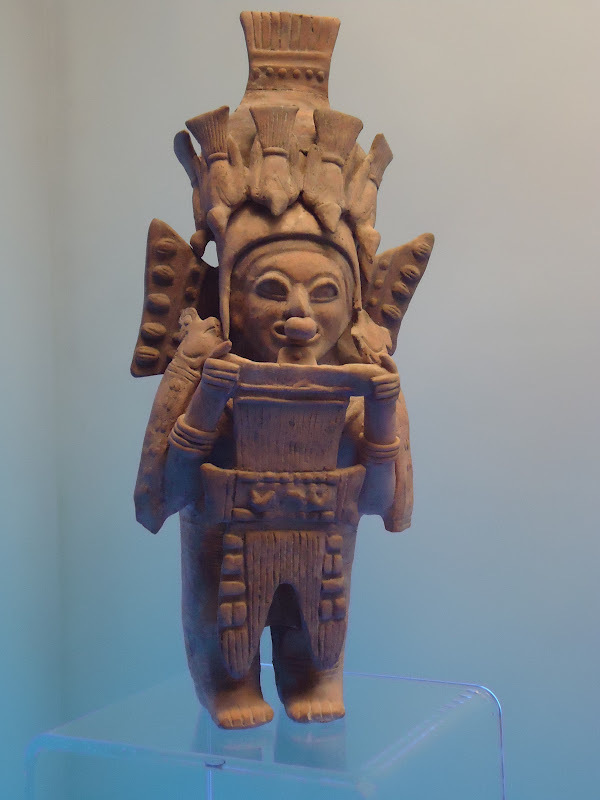 Professional, well-curated, the museum shows us 11,000 years of history with artifacts from this historically-rich region. The collection's heart & soul is pottery, tools, weapons, jewelry, sacred relics, and artifacts from the pre-Colombian cultures Valdivia, Bahia, Caras, Tolita, Machalilla, Chorrera, Jamas-Coaque, Guangala, Las Vegas,and Manteña cultures who inhabited the coast for centuries before the arrival of the Spanish. One particularly fine example of workmanship are the carved Manteño stools. There are also exhibits describing pre-Colombian seafaring with the massive balsa raft display in the entrance. 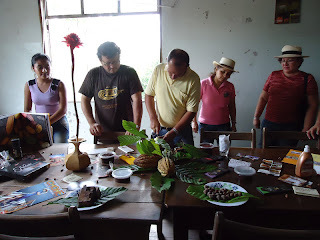 It covers the commerce and navigational history of Bahía with numerous expositions. The highly coveted Spondylus shell aggressively traded in pre-Hispanic society is on display. The upper exhibit hall interactively educates the public on past cultures of the area, and entertaining for all ages. The museum hosts a large visual arts exposition, and an active cultural event program - watch for notices at the museum. outcrop hosts many engravings representing men, women and animals. In San Vicente is a mastodonte skeleton. www.chirije.com for information about visiting. 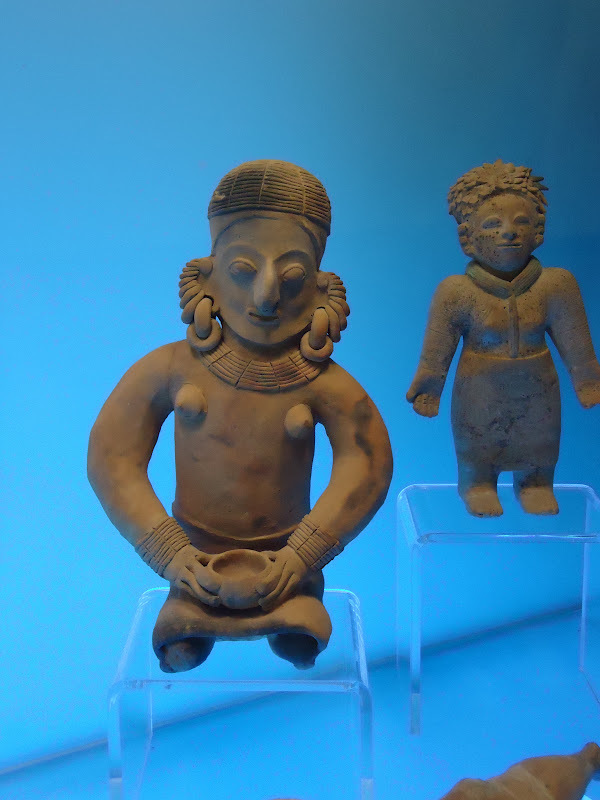 Archeological site and exhibition for the Valdivia culture. into a tourist attraction with more amenities and an on-site museum"
potential if marketed and developed correctly to the tourists. With an abundance of fresh fruit & cheeses and a wide variety of fresh seafood, the region provides popular dishes of ceviche (lime-flavored seafood), viche - made with fish and peanuts, salprieta ground peanuts & corn, with spices, pan de almidon ( cassava bread ) fresh and fried seafood, morcilla ( blood sausage ) and natural freshly squeezed fruit juices. The area is also a good place to order a Bar-b-qued steak, as many of Ecuador's cattle ranches are located inland just a few miles. Ecuador is one of the most important Banana producing and exporting countries. 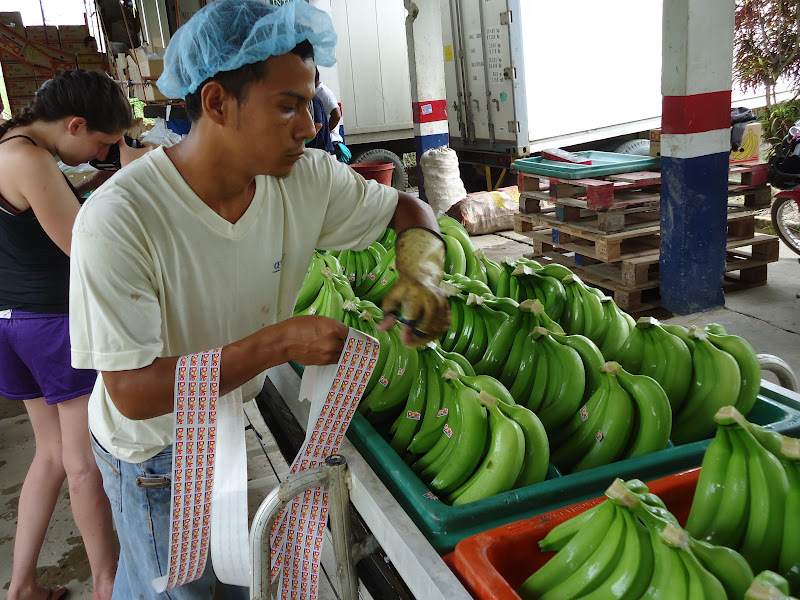 With its warm, tropical weather, Ecuador produces some of the best bananas in the world. 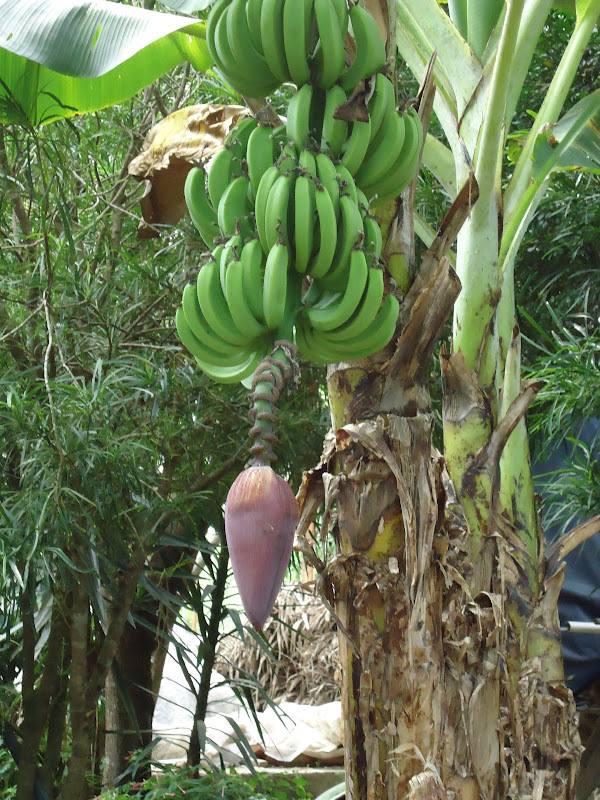 After rice, wheat, and corn, bananas are the fourth most widely consumed food eaten by millions of people every day (a valuable source of Vitamin A, Vitamin B6, Vitamin C as well as potassium). Bananas are grown in 130 countries worldwide – more than any other fruit crop. 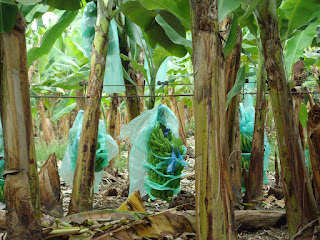 The dominant banana importers are European countries (29.2%), U.S. (27.5%), Japan (8.2%), Russia (7.9%) and Canada (3.5%). 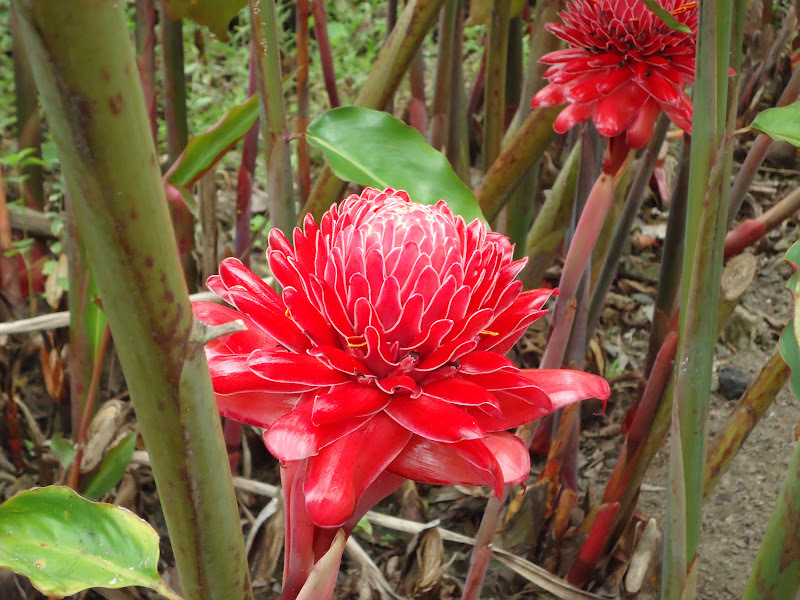 Visit a Dole plantation to learn about the amount of effort that goes into each piece of fruit and the process it takes to arrive to its destination. Tour the plantation, factory line, packaging, and harvesting processes. 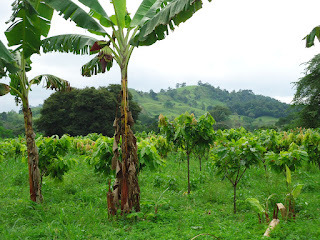 Banana plantations are numerous around Ecuador. 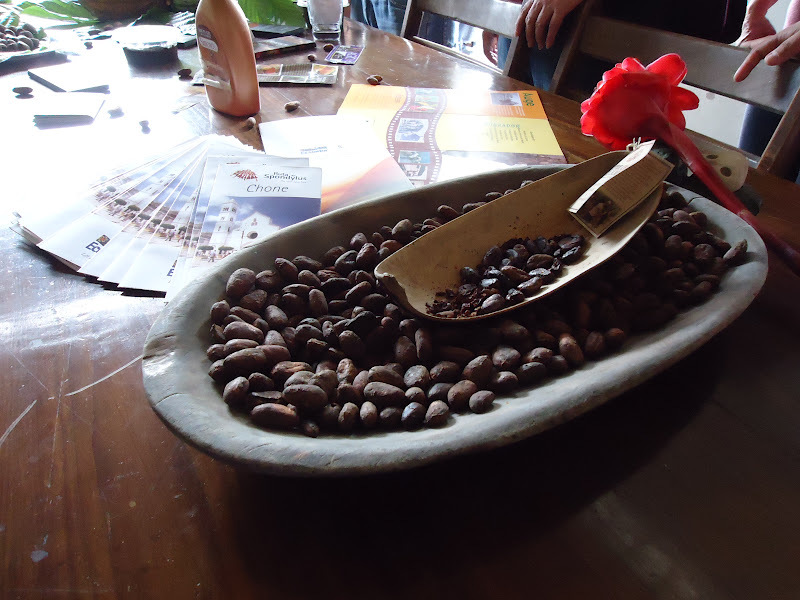 Until the 1920s cacao production contributed almost 80% to the national economy until the global cacao industry suffered several crisis and sales declined. The cocoa tree is a small tree. 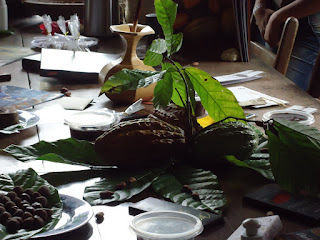 It produces cocoa pods on its woody trunk and brunches. 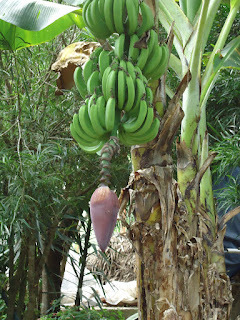 The 20cm long pods are red or yellow and are hard. Cocoa pods are produced throughout the year. harvesting, preparing, roasting, and grinding to make fine chocolate. 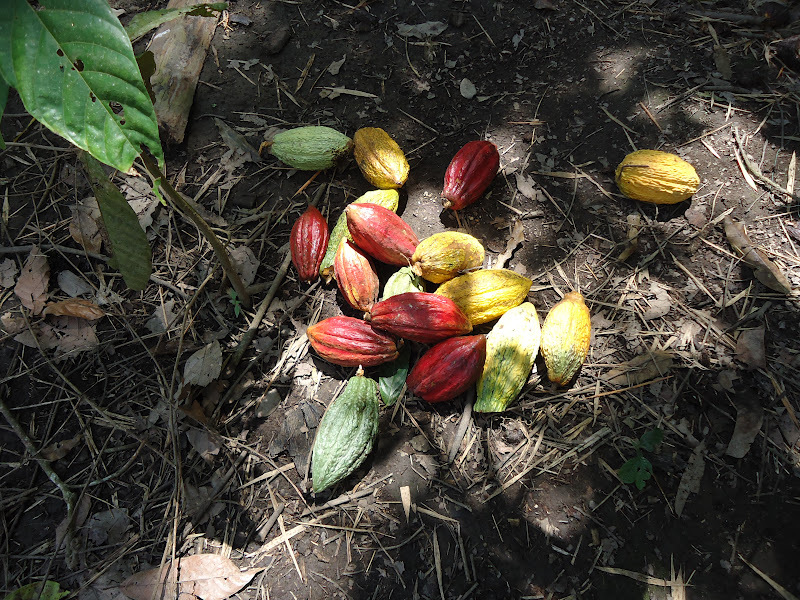 products derived from the fresh chocolate. 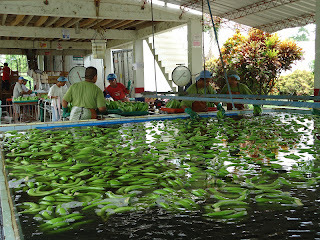 farms have been able to sustain a large number of shrimp. Small neighbouring fishing villages stretch along some fine sandy beaches which are very popular on the weekends. The coastal town of Crucita is a hidden jewel among Ecuador's beaches. It is a quaint, charming, and welcoming fishing village with a beach malecon full of seafood restaurants set below a hillside of whitewashed, bougainvillea lined Mediterranean style housing. From beautiful beaches, to the adventurous thrills of paragliding and whale watching , to delicious food and drink, Crucita has it all. Crucita's high picturesque bluffs, and good wind conditions, are conductive to airborne activities. The warm thermal currents against the southern hills make it an ideal site for paragliding, a sport for which it has quickly become internationally renowned. The town hosts a flight school as well as lessons and tours. These tours commence and end on the upper hills above the town, and boast incredible scenic views of the surrounding countryside. If you wish to give the sport a try, Raul or Luis Tobar are the town's most highly recommended flying guides. They are well-trained professional instructors. A fifteen minute tandem ride requires no previous experience and costs $ 35 . Another popular activity for visitors to Crucita is humpback whale watching or dolphin spotting. The whale watching season runs from approximately June to September. During these months the whales migrate north from the Antarctic with the Humboldt Current in order to gather in the warm, shallow waters off of the Ecuadorian coast in search of a mate. They travel individually, in pairs, or sometimes in groups of eight at a time. Whale calves are born and fed to develop fat reserves for their return migration in September/October, while the courting adults perform spectacular displays with impressively breaching the water with their leaps and tail thrashing. Whale watching tours generally last between 2 - 4 hours ( $ 15 - $ 25 ) and depend on the type of operator from professional to an off-duty fiberglass fishing boat which has been temporarily re-purposed for tourism. The open ocean can be very rough for those with seasickness. Our rainy season is between January and April with more sun and warmer temperatures. If you would like cooler dry weather and want to see the humpback whales that pass by offshore you should visit between late June and August. Bahía's bus station is located in the south of the city. There are bus connections to Quito and Guayaquil on Reina del Camino. 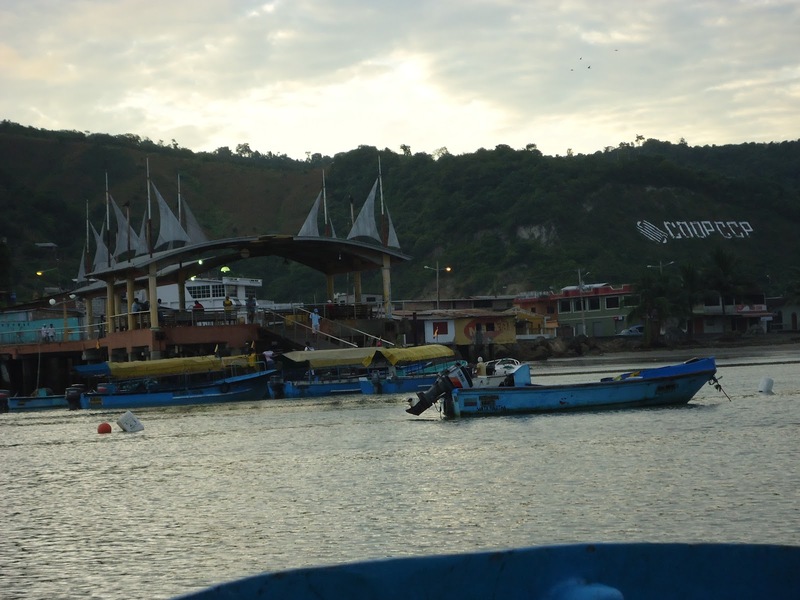 Buses to the northern Manabí and Esmeraldas coasts leave from San Vicente, across the river. If you are driving, there is a good road south to Manta and Guayaquil. If you are driving to Quito, you will have to go through Portoviejo or Chone, or across the bridge through Pedernales and Santo Domingo.